Buddy eats Curt’s birthday present! “Uh, oh.” I didn’t like the sound of the word ‘issue.’ “Oh, what’s that?” I asked, trying to act nonchalant. Away we went. Ironically, the name of the facility I was instructed to take Buddy to is, “Bright Eyes and Bushy Tails.” Buddy’s eyes were not bright and his tail, although bushy (his breed is nicknamed Saber Tail), was droopy. Bright Eyes and Bushy Tails is a wonderful emergency animal facility, and Buddy had the pleasure of spending the night. And the next night. I just handed over my credit card and didn’t whine. Meanwhile, back at the Empty Nest Farm, we had a wingding of a birthday party for my 70th birthday. Seventy! Who would have “thunked” it? Both of my kids were in attendance, with their kids, along with Ginnie’s sister. We had 24 oz t-bones on the grill, sweetcorn, “mushmellon,” sliced garden tomatoes, cucumber salsa, hotdogs and macaroni-and-cheese for the kids, “pink fluff” and, for the grand finale, zucchini-chocolate birthday cake. Yippee! It was delicious! The only thing missing was Buddy. 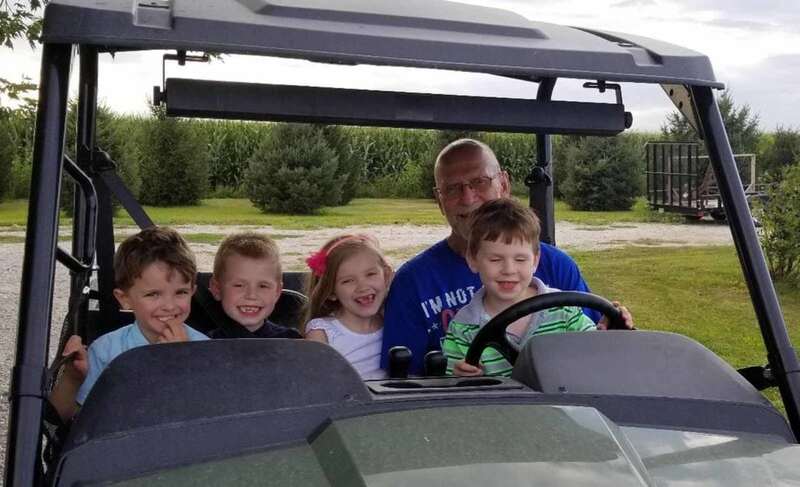 “Papa Swarm” got to give his grandkids rides on the Gator, and help them roast ginormous marshmallows over a bonfire for s’mores. Then it was the special treat of throwing sweetcorn cobs in for the chickens — they go nuts — and petting Blossom. Those ornery grandkids even enticed “Papa Swarm” into a game of tag. It was the best birthday I’ve ever had. As I was catching my breath, I thought, “Ha! Buddy might have been doing me a favor by eating that chocolate. He knew I didn’t need all those calories.” I have been losing weight on the E&E Diet (Eggs & Exercise). To date, I’ve lost 43 pounds and am down to 191 — shooting for 180. Ginnie has joined me and is the slimmest I’ve ever seen her. Woo Woo! Buddy came home after the second day and was bright eyed and bushy tailed. I want to thank all of Buddy’s Facebook Friends for their prayers and kind words. Next week, details of the E&E Diet.